Keeping your budget in mind might mean you look towards buying a used vehicle. But at Smith Motor Sales of Haverhill, you can get that luxury Mercedes-Benz feeling without opting for a much older model. Our certified pre-owned inventory offers North Andover drivers quality vehicles that come equipped with the latest tech and features, without paying that new vehicles sticker price. New Price! MERCEDES BENZ CERTIFIED / CPO, ONE OWNER, LOCAL TRADE, FULLY SERVICED & WHITE GLOVE DETAILED, 4MATIC®. Mercedes-Benz Certified Pre-Owned Details: * Transferable Warranty * Includes Trip Interruption Reimbursement and 7 days/500 miles Exchange Privilege * Limited Warranty: 12 Month/Unlimited Mile beginning after new car warranty expires or from certified purchase date * 165 Point Inspection * Roadside Assistance * Warranty Deductible: $0 * Vehicle History Steel Gray 2015 Mercedes-Benz C-Class C 300 4MATIC® 2.0L I4 Turbocharged 7G-TRONIC PLUS 7-Speed Automatic 4MATIC® 24/31 City/Highway MPG Reviews: * Swift and smooth acceleration; whisper-quiet interior; easy-to-use regenerative braking; attentiveness monitoring system that warns drivers when they exhibit signs of drowsiness behind the wheel; a nice palette of options. Source: Edmunds Smith Motor Sales offers Special Finance Rates for All Certified Pre-Owned Mercedes-Benz!! Talk to a Salesperson Today!!! Recent Arrival! MERCEDES BENZ CERTIFIED / CPO, ONE OWNER, CLEAN CAR FAX, FULLY SERVICED & WHITE GLOVE DETAILED, 4MATIC®. Black 2013 Mercedes-Benz E-Class E 350 4MATIC® 3.5L 6-Cylinder DOHC 7-Speed Automatic 4MATIC® Odometer is 8788 miles below market average! Smith Motor Sales offers Special Finance Rates for All Certified Pre-Owned Mercedes-Benz!! Talk to a Salesperson Today!!! Recent Arrival! MERCEDES BENZ CERTIFIED / CPO, ONE OWNER, CLEAN CAR FAX, LOCAL TRADE, FULLY SERVICED & WHITE GLOVE DETAILED, 4MATIC®, Blind Spot Assist, Panorama Sunroof. Diamond Silver 2016 Mercedes-Benz C-Class C 300 4MATIC® 2.0L I4 Turbocharged 7G-TRONIC PLUS 7-Speed Automatic 4MATIC® Odometer is 661 miles below market average! 24/31 City/Highway MPG Reviews: * Broad range of engine choices; quiet, upscale and well-built interior with a roomy backseat; long list of standard safety and technology features. Source: Edmunds Smith Motor Sales offers Special Finance Rates for All Certified Pre-Owned Mercedes-Benz!! Talk to a Salesperson Today!!! Recent Arrival! MERCEDES BENZ CERTIFIED / CPO, ONE OWNER, CLEAN CAR FAX, FULLY SERVICED & WHITE GLOVE DETAILED, 4-Wheel Disc Brakes, COMAND® System w/Hard Drive Navigation, DVD Player, Multimedia Package, Rear-View Camera, Single CD/DVD Player, SiriusXM Traffic & Weather, Voice Control. Grey 2016 Mercedes-Benz GLA 250 4MATIC®® 2.0L I4 DI Turbocharged 7-Speed Automatic 4MATIC®® 24/32 City/Highway MPG Reviews: * Sporty handling and performance from base model; stunning performance from AMG® version; ample safety features. Source: Edmunds * Broad range of engine choices; quiet, upscale and well-built interior with a roomy backseat; long list of standard safety and technology features. Source: Edmunds Smith Motor Sales offers Special Finance Rates for All Certified Pre-Owned Mercedes-Benz!! Talk to a Salesperson Today!!! Recent Arrival! MERCEDES BENZ CERTIFIED / CPO, ONE OWNER, CLEAN CAR FAX, 4 MATIC, FULLY SERVICED & WHITE GLOVE DETAILED, 4MATIC®, Adaptive Highbeam Assist, Black DINAMICA Headliner, Blind Spot Assist, designo® Mystic Red Leather Package, designo® Mystic Red Leather Upholstery, Full-LED Headlamps w/Active Curve Illumination, Lane Keeping Assist, Lane Keeping Assist Package Code, Lane Tracking Package, Lighting Package. Diamond White 2016 Mercedes-Benz E-Class E 350 4MATIC® 3.5L 6-Cylinder DOHC 7-Speed Automatic 4MATIC® 20/28 City/Highway MPG Reviews: * Broad range of engine choices; quiet, upscale and well-built interior with a roomy backseat; long list of standard safety and technology features. Source: Edmunds Smith Motor Sales offers Special Finance Rates for All Certified Pre-Owned Mercedes-Benz!! Talk to a Salesperson Today!!! MERCEDES BENZ CERTIFIED / CPO, ONE OWNER, CLEAN CAR FAX, 4 MATIC, FULLY SERVICED & WHITE GLOVE DETAILED, 4MATIC®®, Adaptive Highbeam Assist, Blind Spot Assist, Corner-Illuminating Lamps, Full LED Headlamps, Lane Keeping Assist, Lane Keeping Assist Package, Lane Tracking Package, Lighting Package. Mercedes-Benz Certified Pre-Owned Details: * Roadside Assistance * Limited Warranty: 12 Month/Unlimited Mile beginning after new car warranty expires or from certified purchase date * Transferable Warranty * Vehicle History * Includes Trip Interruption Reimbursement and 7 days/500 miles Exchange Privilege * Warranty Deductible: $0 * 165 Point Inspection Black 2015 Mercedes-Benz E-Class E 400 4MATIC®® 3.0L V6 DI DOHC 7-Speed Automatic 4MATIC®® 20/28 City/Highway MPG Reviews: * If you're seeking a well-constructed luxury car heavy on safety, luxury and respectability, Mercedes-Benz's 2015 E-Class sedan, coupe, convertible and wagon have much to offer. The E-Class' clean styling seems to stand the test of time, another plus for those who don't flip their cars every two years. Source: KBB.com * Superb ride; wide variety of body styles; strong engines; smooth and efficient diesel; extensive safety features. Source: Edmunds * With a modern interpretation of design cues made iconic by their legendary predecessors, the Mercedes-Benz E-Class delivers a style that is both timeless and trendsetting. Now available in two front-end treatments: bold or sport, a driver can choose a coupe, convertible, sedan, or a wagon. In addition, the E-Class offers a slew of engines ranging from a 2.1L turbodiesel, a 3.5L V6, a 3.5L V6 mated to a hybrid electric motor, a 4.6 V8, and an incredibly strong 5.5L AMG® V8. Available 4MATIC® all-wheel drive adds to your control as well. The body rests upon fine alloy wheels and four-lamp LED headlights help increase the visibility of the vehicle to oncoming traffic. LED technology also delivers quicker illumination of the brake lamps. On the inside, modifications include a host of available upholstery, including MB-Tex upholstery or leather. The seats, for four to five passengers depending on model, are beyond comfortable with more than adequate headroom and ergonomic features. Featuring a high-resolution color-LCD display and a central controller on the console, the Cockpit Management and Data (COMAND®) system gives convenient control of audio, video, hands-free calling and optional navigation functions. An advanced system of nine standard airbags offers enhanced occupant protection. ATTENTION ASSIST® continuously monitors different parameters of driving behavior, and can automatically alert the driver with both visual and audible warnings. Adaptive braking technology integrates a suite of advances. Predictive brake priming sets the pads closer to the discs for more immediate response when brakes are applied. In the rain, automatic brake drying periodically applies the brakes just enough to sweep water build-up from the discs. Source: The Manufacturer Summary Awards: * 2015 IIHS Top Safety Pick+ Smith Motor Sales offers Special Finance Rates for All Certified Pre-Owned Mercedes-Benz!! Talk to a Salesperson Today!!! Recent Arrival! MERCEDES BENZ CERTIFIED / CPO, ONE OWNER, CLEAN CAR FAX, LOCAL TRADE, 4 MATIC, NAVIGATION / GPS, NON SMOKER CAR, FULLY SERVICED & WHITE GLOVE DETAILED, 115V AC Power Outlet, KEYLESS GO®, Lane Tracking Package Code, Navigation Updates For 3 Years, Premium Package, Radio: COMAND®® System w/Navigation, Rear-Seat Entertainment, Region Coding, Single DVD Player, SIRIUS XM Satellite Radio. Mercedes-Benz Certified Pre-Owned Details: * Roadside Assistance * Warranty Deductible: $0 * Limited Warranty: 12 Month/Unlimited Mile beginning after new car warranty expires or from certified purchase date * Transferable Warranty * Includes Trip Interruption Reimbursement and 7 days/500 miles Exchange Privilege * 165 Point Inspection * Vehicle History Polar White 2016 Mercedes-Benz GLE 350 4MATIC® 3.5L V6 DOHC 24V 7-Speed Automatic 4MATIC® Reviews: * Broad range of engine choices; quiet, upscale and well-built interior with a roomy backseat; long list of standard safety and technology features. Source: Edmunds Smith Motor Sales offers Special Finance Rates for All Certified Pre-Owned Mercedes-Benz!! Talk to a Salesperson Today!!! Recent Arrival! MERCEDES BENZ CERTIFIED / CPO, ONE OWNER, CLEAN CAR FAX, LOCAL TRADE, FULLY SERVICED & WHITE GLOVE DETAILED. Gray Metallic 2016 Mercedes-Benz GLC 300 4MATIC® 2.0L Turbocharged 9-Speed Automatic 4MATIC® 21/28 City/Highway MPG Reviews: * Elegant interior and exterior design; excellent balance of performance and comfort; abundant safety equipment even for this segment; generous, family-friendly backseat space; fuel-efficient turbocharged engine. Source: Edmunds * Broad range of engine choices; quiet, upscale and well-built interior with a roomy backseat; long list of standard safety and technology features. Source: Edmunds Awards: * JD Power Vehicle Dependability Study Smith Motor Sales offers Special Finance Rates for All Certified Pre-Owned Mercedes-Benz!! Talk to a Salesperson Today!!! MERCEDES BENZ CERTIFIED / CPO, ONE OWNER, CLEAN CAR FAX, LOCAL TRADE, 4 MATIC, 4MATIC®. Black 2017 Mercedes-Benz C-Class C 300 4MATIC® 2.0L I4 Turbocharged 7G-TRONIC PLUS 7-Speed Automatic 4MATIC® Odometer is 8252 miles below market average! 24/31 City/Highway MPG Reviews: * The interior is impeccably crafted; there are plenty of available cutting-edge features; exterior styling turns heads everywhere. Source: Edmunds * Balance of comfort and performance makes it an appealing daily driver; solid fuel efficiency from the standard four-cylinder engine; plenty of room for adult-sized passengers in back; a long list of advanced safety features are available; elegant design inside and out gives it a true luxury appearance. Source: Edmunds * Balance of comfort and performance makes it an appealing daily driver; solid fuel efficiency from the standard four-cylinder engine; plenty of room for adult-sized passengers in back; elegant design inside and out gives it a true luxury appearance. Source: Edmunds Smith Motor Sales offers Special Finance Rates for All Certified Pre-Owned Mercedes-Benz!! Talk to a Salesperson Today!!! ONE OWNER, CLEAN CAR FAX, LOCAL TRADE, NON SMOKER CAR, 4MATIC®. 2017 Mercedes-Benz C-Class C 300 4MATIC® Iridium Silver 2.0L I4 Turbocharged 7G-TRONIC PLUS 7-Speed Automatic 4MATIC® Odometer is 3948 miles below market average! 31/24 Highway/City MPG Mercedes-Benz Certified Pre-Owned Details: * Vehicle History * Warranty Deductible: $0 * Includes Trip Interruption Reimbursement and 7 days/500 miles Exchange Privilege * Roadside Assistance * Limited Warranty: 12 Month/Unlimited Mile beginning after new car warranty expires or from certified purchase date * Transferable Warranty * 164 Point Inspection Reviews: * The interior is impeccably crafted; there are plenty of available cutting-edge features; exterior styling turns heads everywhere. Source: Edmunds * Balance of comfort and performance makes it an appealing daily driver; solid fuel efficiency from the standard four-cylinder engine; plenty of room for adult-sized passengers in back; elegant design inside and out gives it a true luxury appearance. Source: Edmunds * Balance of comfort and performance makes it an appealing daily driver; solid fuel efficiency from the standard four-cylinder engine; plenty of room for adult-sized passengers in back; a long list of advanced safety features are available; elegant design inside and out gives it a true luxury appearance. Source: Edmunds Smith Motor Sales offers Special Finance Rates for All Certified Pre-Owned Mercedes-Benz!! Talk to a Salesperson Today!!! MERCEDES BENZ CERTIFIED / CPO, ONE OWNER, CLEAN CAR FAX, LOCAL TRADE, 4 MATIC, FULLY SERVICED & WHITE GLOVE DETAILED, 4MATIC®. Mercedes-Benz Certified Pre-Owned Details: * Limited Warranty: 12 Month/Unlimited Mile beginning after new car warranty expires or from certified purchase date * 165 Point Inspection * Transferable Warranty * Roadside Assistance * Vehicle History * Includes Trip Interruption Reimbursement and 7 days/500 miles Exchange Privilege * Warranty Deductible: $0 Polar White 2017 Mercedes-Benz C-Class C 300 4MATIC® 2.0L I4 Turbocharged 7G-TRONIC PLUS 7-Speed Automatic 4MATIC® Odometer is 8252 miles below market average! 24/31 City/Highway MPG Reviews: * The interior is impeccably crafted; there are plenty of available cutting-edge features; exterior styling turns heads everywhere. Source: Edmunds * Balance of comfort and performance makes it an appealing daily driver; solid fuel efficiency from the standard four-cylinder engine; plenty of room for adult-sized passengers in back; elegant design inside and out gives it a true luxury appearance. Source: Edmunds * Elegant interior and exterior design; excellent balance between agile handling and a comfortable ride; abundant safety equipment that is better executed than most; fuel-efficient turbocharged engine. Source: Edmunds Smith Motor Sales offers Special Finance Rates for All Certified Pre-Owned Mercedes-Benz!! Talk to a Salesperson Today!!! MERCEDES BENZ CERTIFIED / CPO, ONE OWNER, CLEAN CAR FAX, FULLY SERVICED & WHITE GLOVE DETAILED. Mercedes-Benz Certified Pre-Owned Details: * Roadside Assistance * Includes Trip Interruption Reimbursement and 7 days/500 miles Exchange Privilege * Warranty Deductible: $0 * Transferable Warranty * Limited Warranty: 12 Month/Unlimited Mile beginning after new car warranty expires or from certified purchase date * 165 Point Inspection * Vehicle History Iridium Silver 2016 Mercedes-Benz GLC 300 4MATIC® 2.0L Turbocharged 9-Speed Automatic 4MATIC® Odometer is 12894 miles below market average! 21/28 City/Highway MPG Reviews: * Elegant interior and exterior design; excellent balance of performance and comfort; abundant safety equipment even for this segment; generous, family-friendly backseat space; fuel-efficient turbocharged engine. Source: Edmunds * Broad range of engine choices; quiet, upscale and well-built interior with a roomy backseat; long list of standard safety and technology features. Source: Edmunds Awards: * JD Power Vehicle Dependability Study Smith Motor Sales offers Special Finance Rates for All Certified Pre-Owned Mercedes-Benz!! Talk to a Salesperson Today!!! Recent Arrival! MERCEDES BENZ CERTIFIED / CPO, ONE OWNER, CLEAN CAR FAX, LOCAL TRADE, FULLY SERVICED & WHITE GLOVE DETAILED, 115V AC Power Outlet, KEYLESS GO®, Lane Tracking Package Code, Navigation Updates For 3 Years, Parking Package, Premium Package, Radio: COMAND®® System w/Navigation, Rear-View Camera, Region Coding, Single DVD Player, SIRIUS XM Satellite Radio. Polar White 2016 Mercedes-Benz GLE 300d 4MATIC® I4 7-Speed Automatic 4MATIC® 22/29 City/Highway MPG Reviews: * Broad range of engine choices; quiet, upscale and well-built interior with a roomy backseat; long list of standard safety and technology features. Source: Edmunds Smith Motor Sales offers Special Finance Rates for All Certified Pre-Owned Mercedes-Benz!! Talk to a Salesperson Today!!! Recent Arrival! MERCEDES BENZ CERTIFIED / CPO, ONE OWNER, CLEAN CAR FAX, LOCAL TRADE, FULLY SERVICED & WHITE GLOVE DETAILED. Gray 2016 Mercedes-Benz GL-Class GL 450 4MATIC® 3.0L V6 Direct-Injection BiTurbo 7G-TRONIC PLUS 7-Speed Automatic 4MATIC® Reviews: * Room for seven adults; authoritative power; available fuel-efficient diesel V6; classy and quiet interior; strong brakes. Source: Edmunds * Broad range of engine choices; quiet, upscale and well-built interior with a roomy backseat; long list of standard safety and technology features. Source: Edmunds Smith Motor Sales offers Special Finance Rates for All Certified Pre-Owned Mercedes-Benz!! Talk to a Salesperson Today!!! MERCEDES BENZ CERTIFIED / CPO, ONE OWNER, CLEAN CAR FAX, LOCAL TRADE, FULLY SERVICED & WHITE GLOVE DETAILED, 4MATIC®. Mercedes-Benz Certified Pre-Owned Details: * Roadside Assistance * Vehicle History * Transferable Warranty * Warranty Deductible: $0 * Includes Trip Interruption Reimbursement and 7 days/500 miles Exchange Privilege * Limited Warranty: 12 Month/Unlimited Mile beginning after new car warranty expires or from certified purchase date * 165 Point Inspection Grey 2017 Mercedes-Benz E-Class E 300 4MATIC® I4 9-Speed Automatic 4MATIC® Odometer is 11397 miles below market average! 22/29 City/Highway MPG Reviews: * Balance of comfort and performance makes it an appealing daily driver; solid fuel efficiency from the standard four-cylinder engine; plenty of room for adult-sized passengers in back; a long list of advanced safety features are available; elegant design inside and out gives it a true luxury appearance. Source: Edmunds * Balance of comfort and performance makes it an appealing daily driver; solid fuel efficiency from the standard four-cylinder engine; plenty of room for adult-sized passengers in back; elegant design inside and out gives it a true luxury appearance. Source: Edmunds * Elegant interior and exterior design; excellent balance between agile handling and a comfortable ride; abundant safety equipment that is better executed than most; fuel-efficient turbocharged engine. Source: Edmunds Smith Motor Sales offers Special Finance Rates for All Certified Pre-Owned Mercedes-Benz!! Talk to a Salesperson Today!!! No matter your driving needs, you’ll find something you love in our selection. The car buying process can be stressful, but we’re here to ease that burden. Contact us today to learn more about these offers, or to talk through our financing options with one of our experienced staff members. 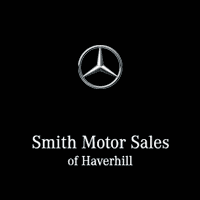 At Smith Motor Sales of Haverhill, we know you’ll find that luxury car you’ve been searching for at a price that you’ll love.